French technology services company SRC Rescoll has partnered with Italian industrial 3D printer manufacturer SME 3NTR to develop an affordable industrial 3D printer that can use high-performance plastics, such as PEEK and ULTEM. The project, named SPECTRAL (which stands for low cost principle of high-performance thermoplastic for structural applications), is a part of the European Commission-funded CleanSky program. The idea for the project, which will be ongoing for the next two years, came from the reality that many affordable 3D printers on the market are geared towards photo-polymerized or sintered materials, which rule out certain high-performance polymers like PEEK and ULTEM (Polyetherimide). Most makers will know the benefits of both these materials, as PEEK is an engineering-grade thermoplastic polymer with strong properties and durability, while ULTEM is a slightly cheaper but similarly strong amorphous thermoplastic. Notably, both materials can be used to make parts with exceptional thermal and mechanical properties that come close to those of certain metals, making them ideal for use in the aerospace, automotive, and medical fields. In recent years, companies and research organizations have been working on adapting the materials for FDM/FFF 3D printing, and with some success. German materials developer Indmatec, for instance, has succeeded in created 3D printable PEEK, though because of the material’s high melting point (requiring a hot end that can reach 400°C), it cannot be used on just any desktop FDM 3D printer. As the companies explain, the SPECTRAL project will oversee the development, testing, and implementation of an FDM 3D printer dedicated to high-performance materials. As part of the CleanSky initiative, the 3D printer will be developed according to specifications put out by European aerospace company Airbus, which will also set the standards for parts produced on the 3D printer. 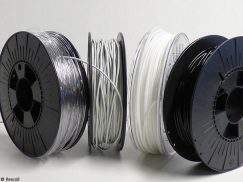 Italian company 3NTR is in charge of developing the 3D printer’s hardware, while French company Rescoll is coordinating the project and is responsible for developing and manufacturing the 3D printable high-performance thermoplastic filaments for the printer. Rescoll is reportedly also developing a database that will enable the automatic recording and tracking of 3D prints.